I'm a sucker for hats and I definitely don't wear them enough, but that doesn't stop me from buying 'em. 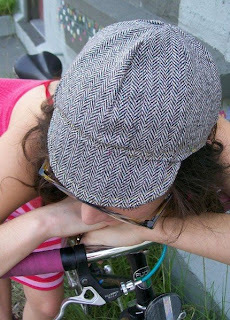 CapsForSale offers cool handmade cycling caps in a variety of fabrics. The designer writes in her shop profile, "i started making these hats because i often have the problem of helmet head since i bike everywhere, haven't owned a car since 2000. they're stylish, collect sweat and rain, and keep sun off your face to boot." Sounds good to me. So if you're in the market for a cycling cap check out CapsForSale. These would also make great gifts...maybe you're in the doghouse with your significant other who happens to love bikes. Forget the flowers, instead pair one of these caps up with this bike card and you'll have 'em eating out of your hands in no time.